Anthony Lowrie addressed students, faculty, the Ad-Hoc Committee on Cultural Competency, and others in his memo following the protest. Seventy-five full-time faculty members signed a brief statement this week clarifying that the faculty assembly chair’s response to student protests do not speak on their behalf and that his views do not represent them. “We are committed to continuing the work of the Ad-Hoc Committee on Cultural Competency, addressing the points raised by POWER in its petition, and working alongside students and the administration in making Emerson a more inclusive place for all,” the letter said. Robert Colby, president of the full-time faculty union and former faculty assembly chair, said he signed the response despite considering Anthony Lowrie a longtime colleague and friend. Lowrie said he believes the community misrepresented and misconstrued the intended message of the memo he sent out last Monday. He said he supports students who experience discrimination on-campus and he didn’t aim to offend or invalidate anyone. He set out to express that the college needs an unaffiliated legal team or agency to assess students’ claims in hopes of finding a solution, he said. “There are too many, it seems to me, vested interests, protecting their own interests rather than saying, ‘Let’s be honest about this and find out what’s going on,’” Lowrie said. Lowrie said he stands by his claims, which he believes are logical and reasonable. His future as faculty assembly chair remains unclear. “People wanted to misconstrue [the message],” Lowrie said, though he could not cite a reason why. In a letter to the Emerson community sent last Thursday, President M. Lee Pelton expressed discontent and disappointment toward Lowrie’s “ill tempered, uninformed” memo in an email to the community, claiming it left him breathless. “Despite the best intentions of your letter, it created division rather than bringing faculty and our community together,” Pelton wrote. Pelton explained Lowrie’s misuse of the terms harassment and discrimination. The legal definitions vastly differ from the colloquial definitions of the words used to describe students’ experiences on campus, he wrote. Pelton said though he agrees that faculty should be informed when accused of misconduct, the Massachusetts statute quoted by Lowrie is inapplicable because it refers to due process and does not relate to the concerns raised in the memo. The Student Government Association discussed potential responses to the memo at the Joint Session Meeting on Tuesday. Executive Treasurer Ian Mandt said he thinks SGA has a duty to respond, but he worries sending out a letter would just emulate what Pelton already said. 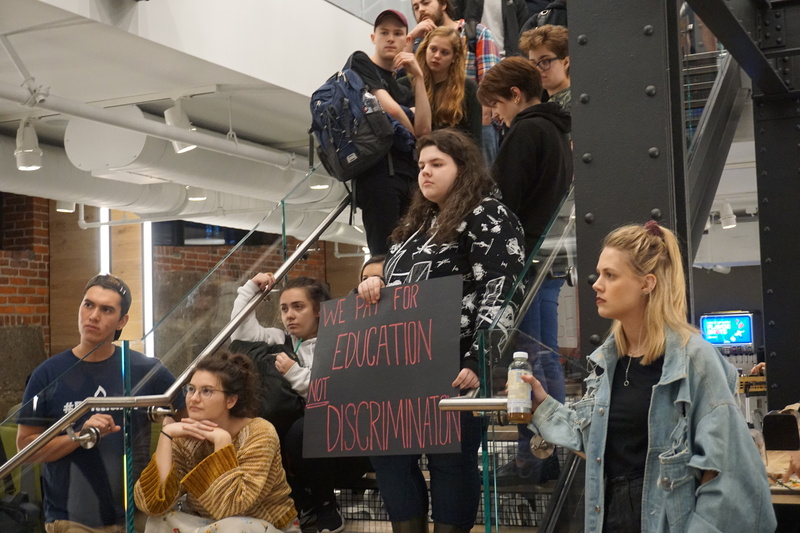 “We made a commitment to make a monthly report of what SGA is doing in response to the protest and petition,” Mandt said. Class of 2019 President Jess Guida said she thinks it may too be late for the organization to respond. “I fear responding to Lowrie now because it's getting farther and farther away from it,” she said. Chris Van Buskirk contributed to this report.